Less than ten years after the ACT Racing Club moved from what is now Lake Burley Griffin to its present location at Lyneham the club introduced a premier 2yo race. It was named the Black Opal run over 1200m. In its first running in 1973 the King of Babylon colt Rich Reward held out a determined challenge from Wanted Man to win in a photo finish. The following year one of only two greys to win was successful in the well named Royal Britannia (Royal Yacht - Port Joy) over Swashbuckler. Royal Britannia had won the Silver Slipper earlier in the season and later went on to stand briefly at stud. The first filly to win was Silver Shadow (by Minor Portion) in 1975 who later went on to win the AJC Warwick Stakes before a short career at stud where she only produced two foals. A second filly won the following year, Bianca who then went on to win the Reisling Slipper trial. In winning Bianca defeated Mexican Dream and talented galloper Romantic Dream. In 1977 the ACTRC attracted the first of its star gallopers to the race when Blazing Saddles (Todman - Lady Simone) took part and duly won from King's Frolic and Absolute Authority. Blazing Saddles had earlier won the VATC Debutant Stakes the VATC Merson Cooper Stakes, VRC Maribyrnong Plate and VATC Blue Diamond. After the Black Opal he went on to the Golden Slipper where he ranged up in the straight but was no match for champion 2yo Luskin's Star ultimately passing the post third. Retired to stud Blazing Saddles sired numerous winners including the stakeswinners Heat of The Moment, Blazing Keel, Crossroads and Beans in Australia. From 1985 to 1989 he stood overseas and sired the champion sprinter Mr Brooks who died tragically in the Breeders Cup Sprint. Returned to Australia in the 90s Blazing Saddles is currently still at stud in Queensland. Gold Mosaic (Baguette-Emblem Girl) defeated top class filly Jewel Flight in 1978 before embarking on a short stud career. Star's Grace was the third filly to meet success in the race when she defeated future sprinter and sire in Zephyr Zip with Pompeaux third. Star's Grace was later the dam of Might Impulse and was pensioned in December 2001. The Biscay colt Nassau won the Black Opal in 1980 and defeated Zephyr Zing and Atlantic Flyer with all three colts going on to stud careers after retirement. After winning the race Nassau then won the Todman Slipper Trial and at stud sired NZ stakeswinner Alynda who also ran third in the 1986 Black Opal. 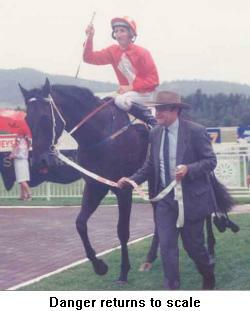 The very promising Chinese Treasure won the Black Opal in 1981 from Twinkle Kingdom and Forever Red. He went on as one of the fancied runners in the Golden Slipper and finished a close fifth but the run took its toll. On returning to the mounting yard he collapsed and died. Sired by Blazing Saddles the filly Beans was successful in 1982 defeating Miss Alaska and Chives. 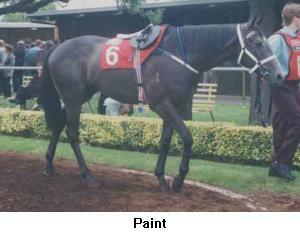 After retirement Beans started a long career as a broodmare and was last listed in New Zealand. By the mid 80s the Black Opal had been recognised as a Group 2 race and was one of the main lead ups to the Golden Slipper. Many winners and placegetters in the Black Opal had gone on to perform well in the Golden Slipper without breaking through. 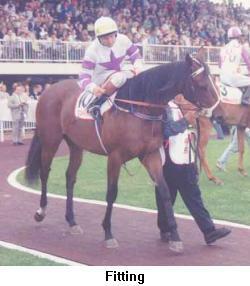 In 1983 Brummel Who defeated Rodeo Song and Rise before embarking on a lengthy stud career but only produced 37 foals. In 1984 the black filly carrying the Kingston colours in Spirit of Kingston won the race from My Gaunlet and Gin and Bitters. Spirit of Kingston was one of the best of her generation going on to win the VRC Oaks, Edward Manifold Stakes, Canterbury Guineas and Rosehill Guineas during her 3yo season. At stud she has produced 12 foals including Taheel Boy, Portland Pirate, VRC Derby winner Portland Player and Kingston Coup dam of Coup de Grace. She is currently in foal to Strategic. In 1985 speedster New Atlantis defeated Crossroads and Dream Lodge giving the Black Opal one of its best representatives in the Golden Slipper. New Atlantis had earlier won the Maribyrnong Plate, SAJC Breeders Stakes plus several other races and was undefeated going into the Slipper. Despite drawing an outside barrier he was still in contention into the straight but couldn't withstand the extreme effort finishing just behind the placegetters as another South Australian in Rory's Jester raced to victory. New Atlantis won the VATC GJ Coles Stakes as an older horse and returned to Canberra for victory in the National Sprint retiring with a record of 31 starts for 10 wins and 8 placings. 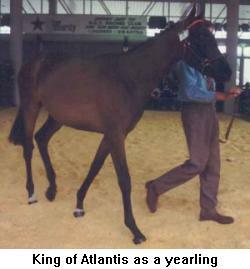 At stud he stood in several locations in Victoria and NSW siring winners such as King of Atlantis and Newreale. He reportedly died a few years ago after suffering a broken leg. Classy filly Just Blooming (Yeats-Ponsalu) won the Black Opal in 1986 before running second in the Golden Slipper behind champion filly Bounding Away. Star fillies Bounding Away and Diamond Shower proved her nemesis during Just Blooming's 3yo year as she consistently ran placings in the big Sydney fillies races unable to break through against the abovementioned fillies. Just Blooming has produced 10 foals so far during her stud career. 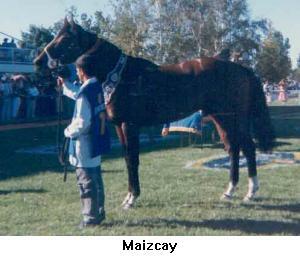 Maizcay was a speedy 2yo by Marscay from Corn and had won the AJC Breeders Plate and STC Silver Slipper during the spring. In the Black Opal he defeated Tennessee Vain and Dream Faith and retired during his 3yo year with a record of 9 starts for 4 wins and 3 seconds. At stud he produced the Group 1 winners Our Maizcay and Seascay plus the stakeswinner Sir Amadi but these topliners appeared too late as Maizcay was sold to Thailand to continue his stud career. Due to quarantine rules horses reportedly cannot be imported back to Australia after landing in Thailand. Blazing Sword was another who was sold before his Group 1 performers emerged. Comely Girl (Marscay - Final Pick) was a speedy member of the Tommy Smith stable and had a very short career racing 6 times at 2yrs for 4 wins. She opened her career with victory in a 2yo Hcp before heading to the Black Opal where she defeated Regional Star and Dalkari. Then she won the Magic Night Stakes then ran a close second to Star Watch in the Golden Slipper. Comely Girl then won the Sires Produce before a third behind Full and By in the Champagne Stakes. She was retired to stud where she has produced 8 foals to date. The following year Mark's Gain (Biscay - Golden Band) won the race from Eire and Pound The Beat. Its was Mark's Gain's sole victory at her third start in a race. After losing form at three she was retired to stud where has she produced 8 foals including Dane's Reward. Mark's Gain is currently in foal to King's Best. Unspoken Word (by Mr Illusion) broke the run of Sydney victories in the event when he defeated Lavinia's Prayer and Commital. 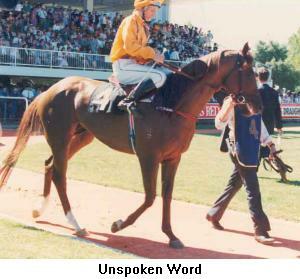 Unspoken Word had earlier won the VATC Blue Diamond Prelude and went on to record 9 victories during his 35 start career. Many of those wins were down the Flemington straight including the Group 1 Gadsden Stakes during his 5yo season. 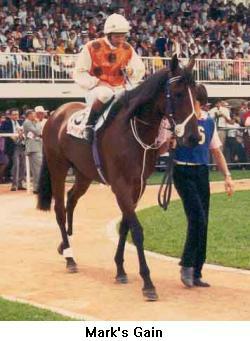 Sormani took out the 1991 running for Queensland when he defeated the Victorian Prosperous Strike and Guam Bear. Sormani missed much of his 3yo season through injury but returned to the track to win at Welter level at 4 and 5yrs. From his 6yo season he raced around country Queensland and retired in February 1998 with a record of 75 starts for 15 wins 12 seconds and 7 thirds. 1992 saw one of the most popular victories in the event when local superstar Clan O'Sullivan defeated Yachtie and Sparky Miss. Clan O'Sullivan (Zoffany - Blazing Bags) won 8 of 10 2yo starts and is thought of as unlucky in the Golden Slipper where he was run down just before the post by Burst. 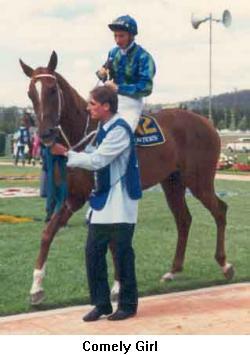 His owner Ken Jones Jnr supplied 10 coach buses to Canberra racing fans to travel to the 1992 Golden Slipper. Soon into his 3yo year he suffered injury problems which would ultimately restricted his race career to 20 starts and missed racing from October 1992 to Jan 1994. 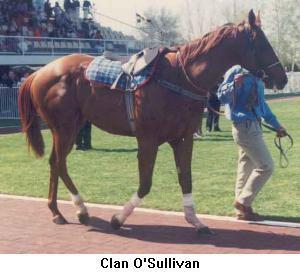 When he returned he had lost much of his brilliance but won the feature Canberra Quality Hcp before being retired. Danger (Bluebird-Glass Fleet) defeated Star Status and Fitting in 1993. He had won first up as a 2yo the previous Spetember and recorded a further 3 placings before being retired after four runs at 3yrs. During a short 3 year stud career before his death he sired many winners including the stakeswinner At Risk, Flirt With Danger, Danace, Dangerous Mission, Mission Time, The Ex Files, Pestalozzi, In Peril, etc. 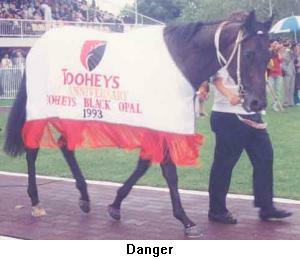 In the early 90s the Black Opal Preview usually run two weeks before the Black Opal gained a higher profile with the ACTRC offering a car and then a pair of cars for the trainer who could take out the race with the same horse. In 1994 David Hayes took up the challenge with then promising 2yo St Covet. After winning the Black Opal Preview St Covet then defeated Rosa's Path and Identikit in the Black Opal Stakes. He went on to run a close second in the Golden Slipper before winning the AJC Sires Produce. As a 3yo he won the Caulfield Guineas and the VATC Autumn Stakes before retiring after finding the distance of the Canterbury Guineas too far. At stud like Danger, St Covet only stood for 3 years with studmasters lamenting his demise as progeny such as Rapid Man, Kbenjar, Shalt Not, Sahara Covet and Star of St Covet appeared. In 1995 ridden by Lester Piggott the Opera Prince colt Zadok also won the Preview-Black Opal double defeating Ravarda and Arrest in the latter. 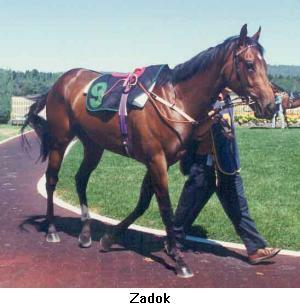 After three runs as a 3yo Zadok succumbed to a stomach ailment his record standing at 10 starts for three wins and a second. Paint had earlier shown promise in racing well in Adelaide and taking out the VATC Blue Diamond Stakes before heading to Canberra on the Golden Slipper trail. 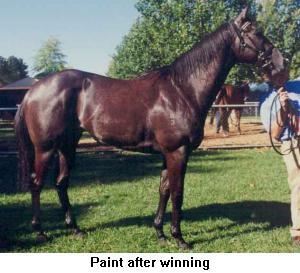 Paint won the 1996 edition easily from Cashier with Master Jolly third ahead of Jacobite. He then went on to run second to Merlene in the Golden Slipper. 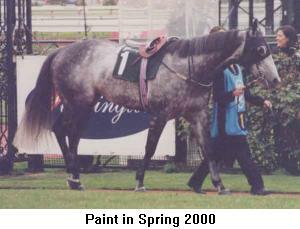 After winning the Up and Coming Stakes Paint was injured and spelled until the summer where he won twice in Melbourne. 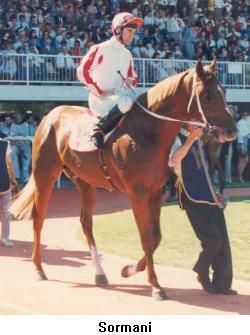 He had further problems before returning to form to run second in the 1999 Oakleigh Plate and winning a Flying in the spring before two seconds at Group 2 level including the AJ Moir Stakes. He won at Listed level in the autumn and then in the spring of 2000 was second in the Sandown Sprint. Another spell followed with a first up second but the leg problems returned and Paint was retired in early 2001. 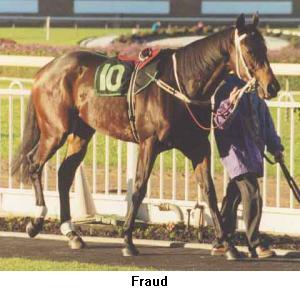 On a bog track in 1997 Fraud did the best to win from Wenders and Vocalist. He went on to win twice at 3 years but struggled to regain form in following seasons. 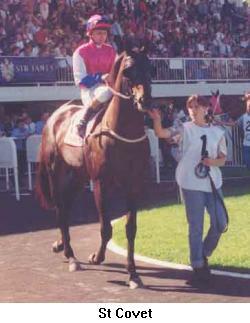 He was sent to Adelaide to try and recapture form but only had two starts in the spring of 2000 and hasn't raced since. In 1998 the Rory's Jester colt Speed Week was too good for Splendid Horse and Paris Dream. He went on to win a further four races before retiring to stud in Western Australia. In 1999 the Frank Cleary trained Catbird (Danehill - Fitting) defeated Aquiver and Citirecruit making up for his dams defeat by Danger. He then went on to make up for stablemate Clan O'Sullivan's defeat by winning the Golden Slipper from Align and Shogun Lodge finally ending the drought for Black Opal winners. Although he returned to win trials at 3 he couldn't recapture his true form and retired to stud with 5 victories from 14 starts. 1999 also marked the downgrading from Group 2 status to Group 3. Pembleton (Marauding-Royal Aria) defeated Donna Dior and Royal Joke in 2000 and in an injury interupted career he has recorded 6 wins and 6 placings from 17 starts. Last years winner Coral Salute (Woodman-Ethnic) nearly died in the months after winning the Black Opal. A veteran of only five race starts Coral Salute recently won a barrier trial and is soon to make a raceday comeback. In recent years the Black Opal has enjoyed a higher interstate profile moving from its traditional Sunday raceday to the Saturday timeslot vacated by the Canterbury Guineas meeting which has been run at night in recent times. There is much interest in this years race with Queensland star filly Calaway Gal and the Gai Waterhouse trained Chuckle both amongst acceptors for the race.